Install our Facebook All in One for Magento 2.0 to get a possibility to use all main features of this social network. With our extension, your clients will be able to use Like, Share, Send to a Friend, Login and Comments box. 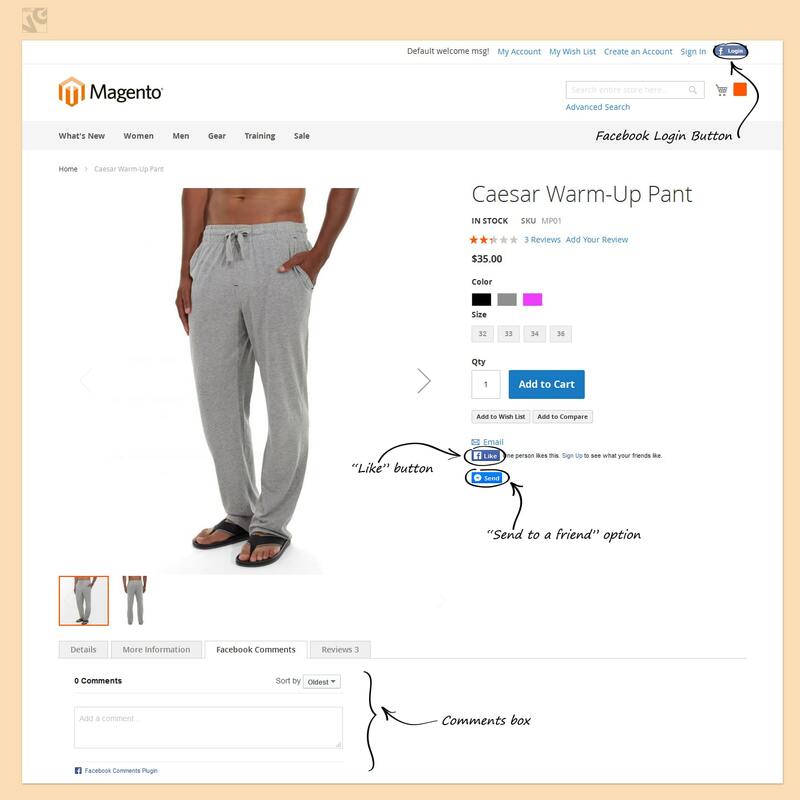 Add these features to every product on your site to help your customers share the product with friends or share their opinion regarding the product and the store. Such sharing can be a great tool for the promotion of your business. Today the word of mouth promotion has its continuation in social media. Your promotional campaign doesn’t always require big investment: your site visits can be boosted by social media promotion. If your customers are fond of your store, they will put their likes and share the products they like with their friends. Integrate your store with the biggest and most popular social network in the world. Add a possibility to use its main features and feel a great influx of visits and enjoy each like and share. Login – it is very convenient for clients to log in to the store, using their Facebook accounts with the help of Facebook Connect. Customers’ Facebook account information is perfectly applicable for successful registrations. Like – when you enter a store, the most obvious analysis you can make is to check the number of likes. You can estimate the popularity of the store and find out whether it’s a successful one (at least in social networks). Even if your store is simply beginning its life, you can install the feature and enjoy each Like and consider it one small step to success. Share – for some, a successful purchase of a great product is something to be proud of and a reason for a post on Facebook. If your customers share with friends on their Facebook feed, there is one obvious result for you: it leads to more visits. More visits translate in more purchases, and it seems this is exactly what every business owner is looking for. Send to a Friend – in today’s world customers still discuss products with each other, but more and more often they discuss it in social networks such as Facebook, they share and they recommend. Each time you find an interesting product, you want to share it with a friend so he or she could advise you and tell whether it’s a good one. Comments box – a great and simple tool for reviews. The easier it is to post reviews, the more reviews you’ll have. And what can be easier than leaving a comment using Facebook comments box? Color Scheme – choose color scheme for the button. Font – choose button text font. This option allows people to leave comments to any products and goods on your website by using their Facebook accounts. Number of posts – the number of posts which will be showed by default.